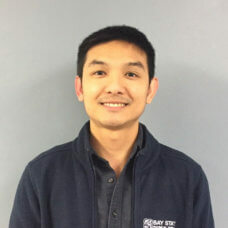 Fred is born and raised in Manila, Philippines where he earned his Masters in Physical Therapy degree from De La Salle in 2005. He has practiced in outpatient and hospital inpatient rehabilitation until moving to the United States back in 2010. He initially joined Baystate in 2012, left in 2016 and since January of 2018, has done split positions in the Attleboro, Taunton and Franklin offices. His experience overseas, as well as various PT settings in Massachusetts and Illinois, equipped him with an eclectic and holistic approach to treating his patients. Outside of work, Fred spends time with his wife, who is also a practicing PT and their very active son. He is active in his local church community, a big Boston Celtics Fan and is a self-confessed petrolhead.